Accurately meters hard-to-handle seeds in continuous drill, including tomatoes, onions, sugar beets, cabbage, lettuce, spinach, etc. Special seed plates for multi-row applications are also available. 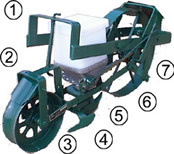 Power from the front wheel turns the feed wheel in the hopper assuring constant flow of seeds. Seeds pass through a hole in the seed plate. the diameter size of the hole controls the amount of seed flow. Three seed plates with 13 holes each come with every drill. This gives you a total of 39 seed flow adjustments ranging in diameter from 3/32" to 3/4". Holes are numbered for easy selection. No calibration is necessary between drills. 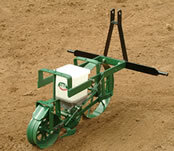 Seed plates change easily without fitted tools. 4" of Float: Cradle bracket allows the drill to float a full 4" up and down. Unique spring suspension permits each drill to follow the contours of the ground independently allowing uniform depth of seed. Download the Cole Planet Jr. Owner's Manual. View Attachments for the Cole Planet Jr.